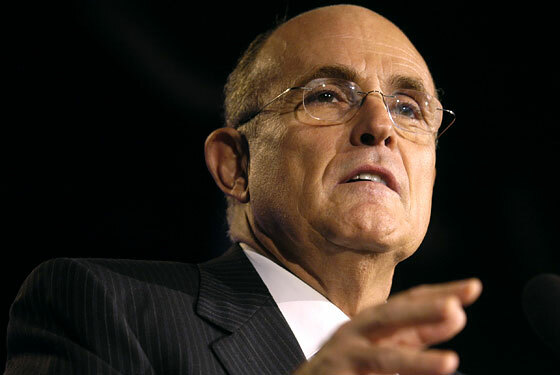 Is Giuliani Betting on a Terror Attack to Get Him Nominated? I was reading Giuliani's op-ed in the Wall Street Journal on 1/9, where he lays out his plans to turn America into a fascist, warmongering, police-state, and I began to wonder if he knows something we don't. His campaign is based entirely on the notion that America is not safe and must continue to attack Muslim nations. But this angle is not working for him. His numbers in Iowa and New Hampshire were laughable. Yet he carries on with this failing technique with remarkable determination, as the mainstream media continues to prop him up and ignore antiwar candidates like Ron Paul. Watch his latest propaganda video called "Ready". His foreign policy team is like a virtual Who's Who of Neoconservative false-flagites: Norman Podhoretz, Daniel Pipes, David Frum, etc. Clearly, these well-connected individuals are not going to sit around while their candidate falters. A gasoline tanker crashed and burst into flames near the San Francisco-Oakland Bay Bridge on Sunday, creating such intense heat that a stretch of highway melted and collapsed. Officials predicted a traffic nightmare for Bay Area commuters for weeks or months to come. Flames shot 200 feet in the air, but the truck's driver walked away from the scene with second-degree burns. No other injuries were reported in the 3:45 a.m. crash, which officials said could have been deadly had it occurred at a busier time. "I've never seen anything like it," Officer Trent Cross of the California Highway Patrol said of the crumpled interchange. "I'm looking at this thinking, 'Wow, no one died' — that's amazing. It's just very fortunate." Authorities said the damage could take months to repair, and that it would cause the worst disruption for Bay Area commuters since the 1989 Loma Prieta earthquake damaged a section of the Bay Bridge itself. Yesterday, news broke that Khalid Shaikh Mohammed, lieutenant of Osama bin Laden, had confessed to masterminding and committing a long list of terrorist acts, including 9/11, the Bali bombing, and the violent murder of Wall Street Journal reporter Daniel Pearl. He also led plots to assassinate Jimmy Carter, Bill Clinton, and the Pope. Mohammed, who has been held at Guantanamo Bay since 2003, said that his confessions had not been made under duress. Still, he confessed to a whole lot of stuff. Which has made some people raise an eyebrow. Guantanamo Bay, where torture is accepted and allowed, and he finally is the guy who admits to doing everything. They finally found the guy. It's not that guy bin Laden. It's this guy they've had since '93. And look, this is the picture they released of him. Doesn't he look healthy? Wolfowitz seems to be obsessed with "surprise attack", warning West Point's Class of 2001 (three months before 9/11) that something big, like Pearl Harbor, is going to happen soon. My technique involves adding a healthy dose of 9/11 truth to a clip from the mainstream media that everyone is talking about. This begins with Keith Olbermann responding to Bush's Iraq speech and concludes with my own special comment along with accompanying music. Note: This is an updated version of the video I posted last Friday. This one only has about 2 minutes of Olbermann - less Keith - and more 9/11 truth. Some day, hopefully, the two will be one and the same. Please recommend this to friends and family who like Keith but haven't figured out the truth about 9/11. This aired last night. Olbermann must be one of our closest friends in the mainstream media. I find him truly remarkable. Listen for when he makes reference to "conspiracy theorists" and "fertilizer". 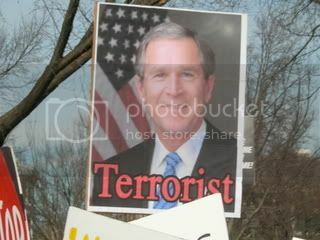 Was he alluding to the 9/11 Truth Movement? Of course, I couldn't resist adding my own special comment about 9/11 at the end of the video. Hopefully, a lot of people will watch this for Keith and end up getting their eyes opened up even more. Watch all eight minutes and tell me what you think of my work. Calling itself "your Independent Conservative Voice of the South Carolina Upstate", The Times Examiner has run a positive review of 911 Press for Truth originally published in The New American. In an interesting side note: the South Carolina paper also has a column defending "Christian Zionism". Seems like they are having some interesting debates down there. 9/11 Press for Truth effectively presents some of the most glaring discrepancies, lies, and coverups concerning the deadliest terrorist attack on American soil. Henry Kissinger "nearly fell off the couch." He spilled his coffee on himself. He was visibly shaken. The next day he announced that he was stepping down as chairman of the 9/11 Commission, the post to which President Bush had named him a couple of weeks earlier. What had caused the always poised and famously unflappable "Dr. K" to come unhinged? Why the abrupt resignation from the chairmanship he had so recently accepted amidst such fanfare? It amazes me that men like Fielding and Zelikow were allowed to be a part of the 9/11 Commission. That is like Johnnie Cochran being picked to be on the jury of the OJ Simpson trial. These biases alone should justify a completely new investigation. This is the key. Once a new investigation begins, it's curtains for the Neocons. Of course, this will require politicians who are not swayed by big oil, AIPAC and the Military/Industrial Complex. Are there any still out there? The Bush Administration is already bracing for our onslaught of justice for the 9/11 Families. Let's get political and stop ranting about "leftist gatekeepers". We need a permanent presence on Capitol Hill demanding a new investigation. We need to reach out to Democrats and Republicans. Remember Curt Weldon? Being GOP doesn't mean you are anti-truth. We need to get mobilized and stop our silly infighting and allegations of "disinfo" and "gatekeeping". The goal is a new investigation. As Lt. Col. Bowman said, "The truth about 9/11 is that we DON'T KNOW the truth about 9/11, and we should". The American public loves mysteries. September 11th is the most obvious Law & Order plot line ever. Even a thirteen year-old could tell you that it was an inside job. That's why all these polls show a massive majority of Americans rejecting the official story. Because it's so obvious who was the real culprit is! So please: stop the bickering and paranoia. Leave paranoia to the people who perpetrated this crime. They are the ones getting scared (article pasted below). ...turns out I lagged behind, and my quality is poor. But nonetheless, I worked hard to get this together, and I had to sit the the entire O'Reilly Factor while holding the puke in. Plus, I added a funny little intro clip and have special commentary and music at the end! Check it out (or just watch the beginning and skip to the end). I am just getting my feet wet with this stuff. Let me know what you think. Blackanthem Military News, WASHINGTON, D.C. – The terror attacks of Sept. 11, 2001, and concerns that another similar attack might follow, gave Defense Secretary Donald H. Rumsfeld "a tremendous sense of urgency" in pushing his transformation effort, he told Pentagon workers today. Rumsfeld said today at his 42nd and last town hall meeting as defense secretary that the Sept. 11 attacks underscored the importance of the transformation program he announced Sept. 10, 2001. "Anyone who lives through Sept. 11 and then sees in their mind's eye the prospects of a Sept. 11 times two or three or four, six months out, has to ask themselves, 'What ought we be doing today to prevent that coming (attack) six months from now?" Rumsfeld said to the audience of hundreds of servicemembers, civilian employees and contractors at the Pentagon and a worldwide TV audience watching on the Pentagon Channel.